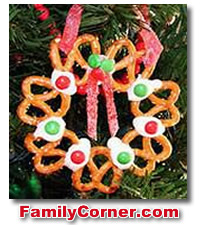 A cute chocolate Christmas ornament is a pretzel candy wreath. Pretzel candy wreaths are easy enough to make and the kids will enjoy hanging them on your Christmas tree as well as taking them down to nibble. Well, this isn't a completely "chocolate" candy recipe, but it DOES contain chocolate, so I say it counts! Like so many of my fun recipes for kids, this clever little idea comes from the Family Corner. Visit them for other great ideas throughout the year. They've got creations for every occasion. If you need a simple Christmas craft to do at a party or just with your children at home, these pretzel wreaths are a great choice. The hardest part is melting the chocolate, but with a tiny bit of supervision, even that's a breeze. I just know you're going to have fun! Now that I've tempted you with the idea of making this simple chocolate Christmas ornament, I guess I better give you the step-by-step instructions. On waxed paper or foil, create wreath circles with 7 pretzels in each, sides touching. Place white chocolate in a microwave safe bowl and heat for 30 seconds and then stir. Repeat until chocolate is melted and smooth. Spoon mounds of chocolate at each place two pretzels meet to 'glue' them together. You can even just place the melted chocolate in a sandwich bag and snip the corner off for more control. While the chocolate is still warm, decorate your wreath by placing M&M's or other mini candies into the melted chocolate. Allow chocolate to set at room temperature. See! I told you it would be simple and cute, didn't I? 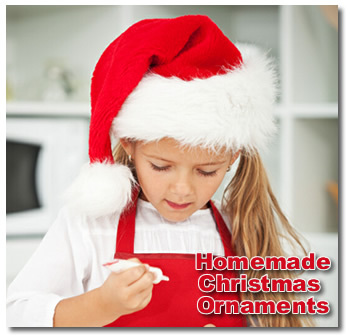 Why not show of your finished wreaths by using the form on the Christmas candy page or adding your own favorite recipe or idea? It's only fair to share!